Matt Waite, who recently won a Pulitzer prize for PolitiFact, is speaking at the 2009 Poynter College Fellowship. UPDATE: The archived audio has been added below. I’ll be livestreaming the Society for News Design New York City meetup from 1-5 p.m. today at the New York Times. Follow the Twitter hashtag #sndnyc. For those reading in RSS, the video and chat embeds are below. I’ve been going almost non-stop since Beyond Bootcamp ended Saturday night, so I haven’t had much time to reflect completely or summarize my thoughts yet. 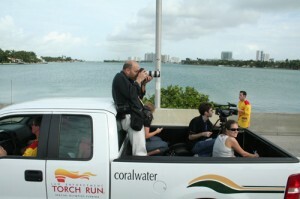 Lauren Whiddon, a photographer and me riding in the back of pick-up while shooting video of the Special Olympics torch run on Jan. 13. Here we are driving on the McArthur Causeway over Biscayne Bay. Photo by Andrea Ballocchi. So, what have I been up to and what’s coming up? Also, an update on the videos from my Beyond Bootcamp livestreaming: the School of Communication post them soon and, hopefully, offer them as video podcasts on iTunes. I’ll be sure to blog and tweet the link when they’re online.